An opulent Jewish London merchant of the eighteenth century. He attained the position—unusual for a Jew in those days—of a director of the Bank of England. In 1727 he brought an action against the Russia Company, which refused to admit him to membership on the ground of his being a Jew. The attorney-general decided that he must be admitted, whereupon the company petitioned Parliament to modify the former's charter so as to give it the right of refusal. Anthony also figured, in 1736, in a case with W. Monmartel relating to a bill of exchange. 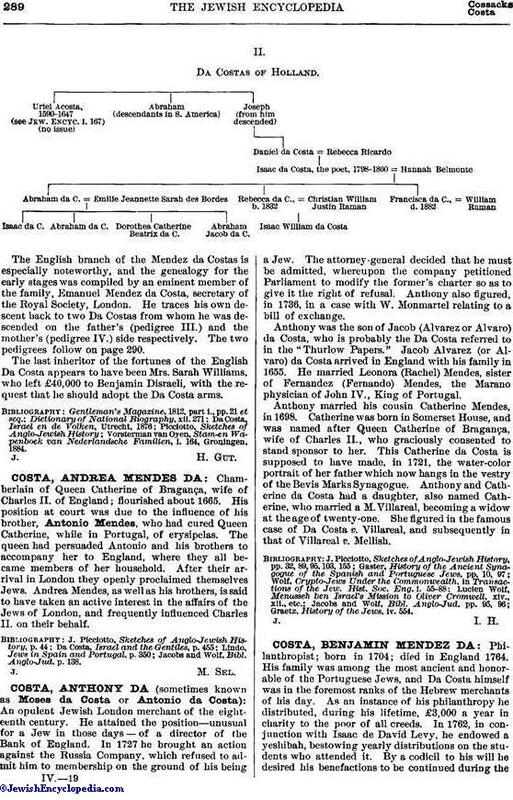 Anthony was the son of Jacob (Alvarez or Alvaro) da Costa, who is probably the Da Costa referred to in the "Thurlow Papers." Jacob Alvarez (or Alvaro) da Costa arrived in England with his family in 1655. He married Leonora (Rachel) Mendes, sister of Fernandez (Fernando) Mendes, the Marano physician of John IV., King of Portugal. Anthony married his cousin Catherine Mendes, in 1698. Catherine was born in Somerset House, and was named after Queen Catherine of Bragança, wife of Charles II., who graciously consented to stand sponsor to her. This Catherine da Costa is supposed to have made, in 1721, the water-color portrait of her father which now hangs in the vestry of the Bevis Marks Synagogue. Anthony and Catherine da Costa had a daughter, also named Catherine, who married a M. Villareal, becoming a widow at the age of twenty-one. She figured in the famous case of "Da Costa v. Villareal, and subsequently in that of Villareal v. Mellish. Graetz, History of the Jews, iv. 554.